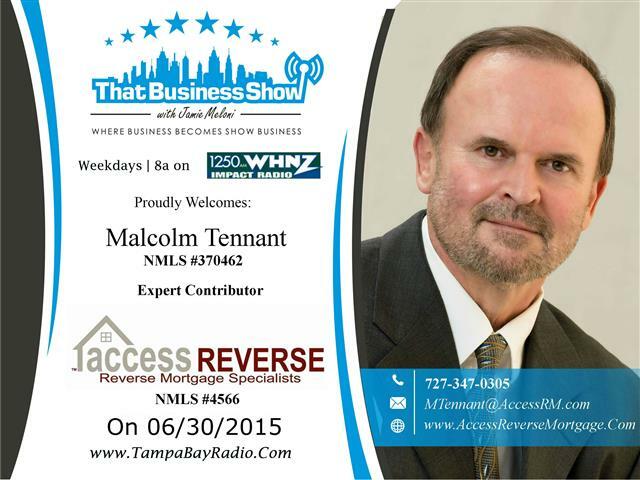 Malcolm Tennant, Expert Contributor to #ThatBusinessShow joined me on today’s show. Malcolm, aka Mac, is the Co-Owner of Access Reverse Mortgage and their company specializes in and only deals in Reverse Mortgages. For seniors aged 62 and older, Reverse Mortgages offer a financial resource to help seniors stay in their homes as well as purchase a new home via the Reverse Mortgage for purchase scenario that Malcolm discussed frequently on the show. Oftentimes we hear of the many myths of the Reverse Mortgage in the media but Malcolm works diligently to dispel those myths through community outreach and speaking engagements on a regular basis and is a trusted resource to give you straight, factual information on the Reverse Mortgage option. Malcolm will be having an informational session on Reverse Mortgages on July 17th at the Greater Tampa Association of Realtors Building on Kennedy Blvd in Tampa and all Realtors and members of the public are invited to attend, free of charge. For more questions, reach out to Malcolm directly. He can be reached at 727-347-0305 or email at mtennant@accessrm.com and visit http://www.accessreversemortgage.com for more information! 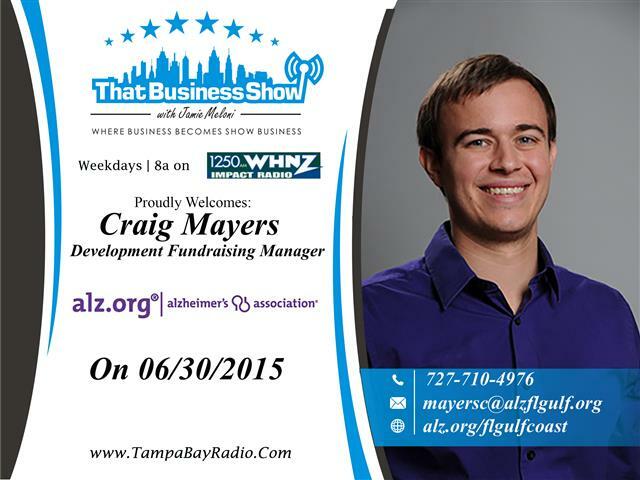 My 2nd guest for the show was Craig Mayers, Development Fundraising Manager for the Gulf Coast Chapter of the Alzheimer’s Association. Their mission is to end Alzheimer’s Disease through the advancement of research, enhancing care and support to those involved and reducing the risk of dementia through the promotion of brain health. Craig talked about some of the many events they have on the calendar to help raise both awareness and funds for the association including the Walk to End Alzheimers which is the big event on 10/31 at the Amalie Arena. Craig also shares many sobering facts around the prevalence of this condition including that today, 5.3 million Americans are living with the disease with a forecast of over 16 million afflicted by 2050. Malcolm also shares his family’s story of battling the disease as Malcolm’s own father was affected and passed away from the disease so Malcolm is very involved in the Alzheimer’s Association due to this and his desire to see the world rid of this terrible affliction. There are many events and ways to get involved in the association and there are many different types of support groups they offer for both caregivers, family members and those afflicted with the disease. Learn more at http://www.alz.org/flgulfcoast and please contact Craig directly at 727-710-4976 on how to get more involved!